Editors's Note: This post is going up after the first game of the season last night. Rather than changing something I'll just fill it in here. If the Steelers don't run the ball and ask Ben to win 13 games, they're in trouble. The Titans don't miss Albert Haynesworth, no matter what you read next. AFC East While the rest of the division seems to be in turmoil, Foxboro is a buzzin'. The defending AFC East Champion Dolphins are going to have to find a new trick this season. With new Jets coach and former Raven defensive mastermind, Rex Ryan, taking over in New York, it won't be long till the Dolphins are solved, if they aren't already. As for those Jets, running the ball and playing defense is a simple plan, but playing defense against a high powered offense in New England? Very unsimple. Speaking of offenses with loads of talent, the Buffalo Bills. The acquisition of everyones favorite distraction, Terrell Owens, paired with 1,000 yard receiver Lee Evans, seems to be a good combination on paper. However, an entire offensive line revamped with rookies and journeymen during the offseason, not a good thing for a quarterback who was sacked 23 times a season ago. The New England Patriots and their bevy of talent (even without the departed Richard Seymour) look to be in control. Rookies Ron Brace and Darius Butler have proved to be NFL ready during the preseason. 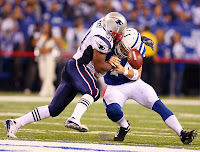 2nd year player and reigning defensive rookie of the year, Jerod Mayo, has taken the reigns of the New England defense. With veterans all over the Patriot defense they are scary. On offense the Pats return you know who and are a force to be reckoned with. The AFC East has alot of unanswered questions, who will win it is not one of them. AFC North The defending champs are returning, wait for it, wait for it, EVERYONE. Have you ever heard a defending champion talked about as little as the Pittsburgh Steelers have been talked about? The Steelers actually return second year player Rashard Mendenhall, so yes they got stronger. This is what you have to know about the AFC North: In 2008, those same defending champion Steelers were 6-0 against the division. The 2nd place Ravens had two division losses, and you know who those were against. More of the same. Bengals seem healthy, they are the Bengals and have won 1 playoff game in 19 years. The Browns may have a new coach, but they are the same old Browns. Quarterback controversy, receiver with the drops, and an aging backfield. As for those pesky Ravens, this defense is fierce as always. Joe Flacco will have to make more plays this year and put the offense on his back, which I expect he'll do. Circle their trip to Foxboro in early October. All things being equal, which they aren't, the Steelers will be the Steelers and the Ravens will play defense. Let's keep this in mind: If the Pittsburgh Steelers reach the Super Bowl in Miami, you'll be hard pressed to not call them The Team of The Decade. AFC South Here's a division which can go one of two ways. 1) Be the most boring division in football. The Colts without Marvin Harrison & Tony Dungy? The Jaguars return after a big drop off in 2008. Can the Titans remain their 2008 form or was Collins a fluke? Are the Texans getting too much hype, can Matt Schaub stay healthy? Or 2) Peyton Manning returns with another weapon in the backfield in rookie Donald Brown. The Jaguars have moved out the trash and will put the ball in Maurice Jones-Drew's hands, the most exciting back in the AFC. The Titans don't need Albert Haynesworth to be, the TITANS. Jeff Fisher will run the ball and have his team playing stout defense. Finally, the Houston Texans, my darlings of the AFC. The year Mario Williams announces how good he really is, the year Matt Schaub delivers to the Texans what they signed on for. Finally, people begin to respect Andre Johnson as the top receiever in this game. The AFC South could be the most interesting division in football, two playoff teams a lock? If your putting my feet to the fire. The Texans and Colts battle this one out, hard to ignore the Jags and Titans right? NFC East The toughest division in football, year in and year out. Rabid fans in New York, Dallas, Philly, and D.C. are preparing for another face knocking in NFL season. Razor thin differences seperate these NFL powerhouses. The Mike Vick experience in Philly is in full swing. Spending as usual, the 'Skins add All-Pro defensive tackle, Albert Haynesworth. Osi Umenyiora is back on the NFL's most underated defense. T.O. in the Northeast, Tony Romo has all eyes on him in Dallas. Which of these teams will come through and win this tough division? Call me what you will, but I like the Cowboys (and Giants). The Giants & Dallas have two things in common, a smashing rushing attack and defenses who stun. From Ahmad Bradshaw and Brandon Jacobs giving the proper dose of power and speed in the Meadowlands to Marion Barber, Felix Jones, and Tashard Choice in Dallas, be prepared to play stout rush defense. 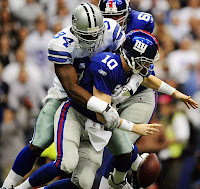 DeMarcus Ware and Justin Tuck anchor defenses ready to take off in 2009. Tuck paired with the new arrival of Chris Canty and comeback of Osi Umenyiora should have enough to provide tough defense from wire to wire. 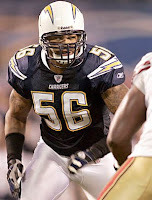 In Dallas the NFL sack leader welcomes the arrival of veteran linebacker Keith Brooking and under the radar defensive tackle Jay Ratliff whose been leading the Cowboy defensive line in recent years. Donovan and Mike in Philly?!?! Too many questions for this Cowboy fan. To Dan Snyder and Washington, call me when Jason Campbell has been replaced. Cowboys & Giants, don't sleep. NFC North (Norris) One word describes this legend of a division: cold. Could it be as easy as Adrian Peterson takes over the NFL in 2009? Aaron Rodgers and the darling Packers regain their 2007 form and rip through the NFC en route to the league championship, right? Congrats Matt Stafford, you won 200% more games than the Lions won last season. Hmm who am I forgetting? Oh, right. The Chicago Bears and their flake of a quarterback who is supposed to save the Bears franchise. Riiiiiiiiiiight. Has a quarterback ever been labled as important without winning anything than Jay Cutler? Cutler threw 18 interceptions last season, he gambles, makes poor decisions, and scares the hell out of me if I'm a Bear fan. In short, I'm an Aaron Rodgers guy. Rodgers had a better quarterback rating, threw more touchdown passes, and less interceptions, not to mention the Packers play tough defense. Aaron Kampman and A.J. Hawk should see more opportunities this season with rookie tackle B.J. Raji clogging up the middle. Stop with the Bears folks, Jay Cutler is human and like Tony Romo & Phil Rivers, he hasn't won anything. Yes I'm dismissing the Lions, nuff said. As for the Vikes? Brett Favre garbage aside, Adrian Peterson is a beast and if he stays healthy you'll be hard pressed to find a play who garners as much importance on a team than Peterson does on the Vikes. Vikes & Packers, in. NFC South No, you know what? I don't care that the Atlanta Falcons play the toughest schedule in the NFL, or at least one of the toughest. At New England, at Dallas, at the Giants, doesn't matter. Michael Turner coming back to earth, doesn't matter. Too big of a turn around, doesn't mean much. Here's the bottom line on the Atlanta Falcons: Matt Ryan has it. Whatever it is that makes Tom Brady and Peyton Manning tick the way they do, Ryan has it. You want me to role up in Foxboro? Fine, see you September 27th. Adding Tony Gonzalez really does make Atlanta scary good on offense. Had to get that off my chest. The rest of the division doesn't do much for me. Till the Saints are ready to play defense, I'll pass. Hats off to Drew Brees who continues to amaze me and I fully expect him to blow up again with Colston back from injury. The Panthers? You know what they say about fool me twice, I watched that debacle against Arizona in the 2008 playoffs. The Bucs? Byron Leftwich right? Replacing your coordinator weeks before the season opens? Right. I'll pass. The NFC South is about one thing, will the Saints every put together a defense and will Matt Ryan take the next step as quickly as he did the first? NFC West Four teams, three new head coaches? There is a possibility that two of the four teams in this division will be drafting in the top ten next season. The 49ers who have yet to sign their top pick Michael Crabtree are weak in the one spot you don't want to be weak, quarterback. The Seahawks are a giant question mark, can Julius Jones carry the backfield? Can Matt Hassleback play an entire season? Is Jim Mora Jr. the right man for this job? I'll pass on the Rams, new head coach Steve Spagnolo has a few years to turn around this ship that was once mighty. The real questions lie in the defending NFC Champion Cardinals. I know that Beanie Wells gives the Cardinals a great young weapon in the backfield, I just don't know if his health will withstand the weekly pounding he'll receive in "The League." Kurt Warner isn't getting any younger and does he have another season like last years in him? The big question surrounding the Cardinals can be answered in a sentence. Do they have what it takes to maintain? His name is Larry Fitzgerald. No wideout in the NFL can say that he threw his team on his back all the way to the Super Bowl, none. Terrell Owens can't. Chad Ochocinco can't. Plaxico had a defense that was second to none. However, Larry Fitzgerald is the toughest player to cover in the entire league, he has the ability to redefine how the position is played. Physical, great hands, gets sepeartion, break-a-way speed. The Cardinals go as far as Larry Fitzgerald takes them, whatever comes next, is gravy. Individual Awards . . .
NFL Offensive Rookie Of The Year Hakeem Nicks, WR, New York Giants. The 20-year old Giant wideout was expecting to become Peyton's newest target, fortunately for little brother Eli, the Colts passed on him. Hakeem Nicks will transform into the star of one of the NFL's youngest groups of receivers that includes fellow rookie Ramses Barden. In the final two preseason games the newest Giant receiver caught a combined three touchdown passes against the Patriots and Jets, including a 64-yard reception in New England. Nicks speed and hands will make him Eli's favorite target by mid-season. If the Giants expect to go far, this rookie will play an important role in doing so. but he'll do more than impress. 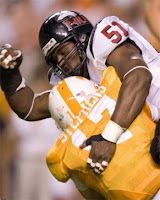 NFL Defensive Player Of The Year Mario Williams, DE, Houston Texans. Let's face it, if the Texans are going to take that next step in 2009 it'll be on the back of Mario Williams and that defense. Williams recorded 12 sacks last season, his second straight season of 12 or more. The Texans will be on full display early with games against the Jets and their rookie quarterback, the Jags and their revamped offensive line, and of course the Oakland Raiders in week four. Finishing the season with Seattle, St. Louis, and Miami should give Williams and the Texans plenty of room to show how dominant he can be. One of the fastest defensive ends in the league, Mario Williams is due and so are the Houston Texans. NFL Coach Of The Year Want a curveball? Norv Turner, San Diego Chargers. Stop laughing. This is the year the Chargers pull it all together. After an injury plagued 2008, the Chargers are finally healthy. Coming off career highs in touchdown passes, completions, and yards, quarterback Phillip Rivers is benefiting from the tutelage of Norv just as other qb's have. With Rivers & Turner being able to develop a scheme using all three 6'5" wideouts and a 6'4" All-Pro tight end in Antonio Gates, be scared. A tough schedule is in line for the San Diego Chargers but avoiding playing Philadelphia and Washington on the East Coast gives the Chargers a leg up. When the Chargers win 12-14 games, it'll be hard to ignore what Norv has done for Phillip Rivers. That's why Norv Turner will be the 2009 NFL Coach of the Year. NFL Most Valuable Player Tom Brady, QB, New England Patriots What else do we need to say? Tom Brady is heading into his personal revenge season. Still stewing from the 1-loss season two years ago, Tom Brady has yet to give payback. After being dropped in week 1 last season, Brady was forced to watch another quarterback lead his team, you don't think that puts anger in the mind? To take it one step further, the Patriot faithful actually were okay with Matt Cassel leading his team, as if to imply Bill Belichick and "The Patriot Way" could make just about anybody a winning quarterback, that's got to sting. Brady is still throwing to Randy Moss and Wes Welker, the same duo that helped him on his way to 50 touchdown passes in 2007. His backfield is stronger with the addition of Fred Taylor via Jacksonville. But of course, his head coach and he are on the same page with the message they want to send in 2009. "We're back, get the hell out of the way." That's why Tom Brady should not be questioned in 2009. That wraps up the 2009 NFL Preview. If the NFL is trying to crush any sport gaining traction this year, they're doing a good job at it. The return of Michael Vick, the comeback of Brett Favre, Pittsburgh looking to repeat, the Patriots looking to remind everyone of who the team of the decade is, can Jay Cutler get it done in Chicago, and finally, what surprises are in store for us this season? That's why the NFL is, and always will be. . . KING.